Belchimac is a Breton miner who lives and works in Karthwasten. He sleeps in Karthwasten Miner's Barracks from midnight to 8am, and works in Sanuarach Mine between 8am and 8pm. He spends the rest of the evening relaxing in the barracks. He wears a set of miner's clothes and a pair of boots, and is equipped with a pickaxe. He carries a key to the miner's barracks and a selection of lower-class loot and gold. Before you reopen the mines, he'll be depressed, saying, "The good mine is closed and the other mine has no ore. Gods have cursed me." He'll keep his attitude when they're open, "Sauranach [sic] mine is open again. How am I supposed to handle all this work?" When asked if he knows where a young girl who lives here is, he'll say, "Yeah, we're all looking for something." Emmon: "When are those Silver-Blood men going to leave?" Belchimac: "Never. They've shut us down forever, Enmon. The Divines have abandoned us." Belchimac: "We're doomed. The mine is going to stay closed, and we'll up be carted of to Cidhna Mine as slaves." 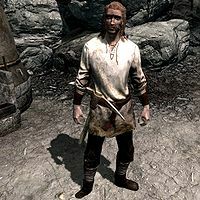 Emmon: "Only criminals get sent to Cidhna Mine. They're not going to send us there." Belchimac: "Oh, they'll find some way to send us there. It'll be just my luck." This page was last modified on 2 June 2018, at 15:54.